The Napa River watershed supports thirty native fish species, including several threatened and/or rare species such as steelhead/rainbow trout, fall-run Chinook salmon, Pacific and river lamprey, hardhead, hitch, tule perch, and Sacramento splittail. The Napa River is estimated to have historically supported a run of 6,000–8,000 steelhead trout, and as many 2,000–4,000 coho salmon (USFWS 1968). By the late 1960s, coho salmon had been extirpated, and steelhead trout had declined to an estimated run of fewer than 2,000 adults. The present-day run of steelhead trout is believed to be less than 200 adults. Introductions of exotic fish species have impacted most freshwater ecosystems in California, including the Napa River. Habitat alterations can determine the species composition of a fish community by favoring certain species over another. Habitat alterations have occurred gradually, but constantly, during the past century. The Napa River system has changed from being dominated by pools and riffles to a morphology dominated by large, deep pools with increased water temperatures and slow-moving water. Much of the Napa River and its tributaries now provide the preferred habitat of predatory fish species, many of which are exotic, such as largemouth bass. The Napa County Resource Conservation District (RCD) conducts fish monitoring in the Napa River watershed to collect information about native fish populations with the emphasis on two salmonid species - steelhead trout (Oncorhynchus mykiss) and Chinook salmon (Oncorhynchus tshawytscha). This monitoring program includes capturing and counting juvenile salmonids as they out-migrate to the ocean as “smolts”, counting adult fish and mapping their spawning distributions, observing juveniles through snorkeling surveys, and long-term tracking of individual fish with implanted transponder tags. Results and reports are available at www.naparcd.org. 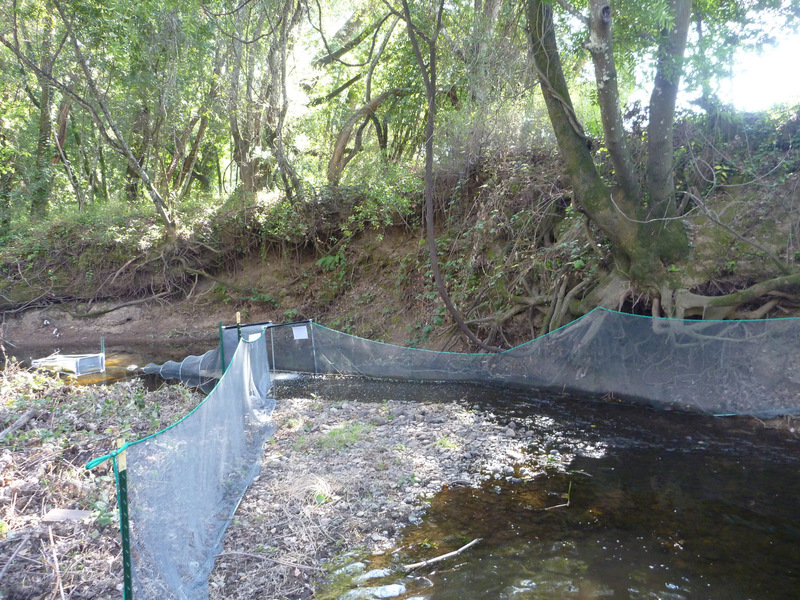 The central component of the RCD’s monitoring program is the rotary screw trap (RST), which is seasonally placed in the lower Napa River near Oak Knoll Avenue. This live capture and release trap is installed at the lowest non-tidal reach of the river where the RCD can collect steelhead and salmon smolts right as they enter the estuary. Other monitoring has been done throughout the watershed, with salmon surveys focused on the mainstem Napa River and steelhead surveys focused more in the tributary streams. The mainstem Napa River provides approximately 29.8 miles of viable salmonid spawning habitat. Additionally, there are approximately 141 miles of tributary streams that support salmonid spawning and freshwater rearing. These totals exclude tidal reaches, which act as vital corridors and transition habitats between freshwater and the ocean. Steelhead in the Napa River watershed are part of the Central California Coast distinct population segment (DPS), which is listed as Threatened under the US Endangered Species Act. The listing was based on a long-term decline in steelhead abundance throughout the DPS, which stretches from just north of Ukiah south to Santa Cruz, and includes all streams tributary to the San Francisco Estuary. 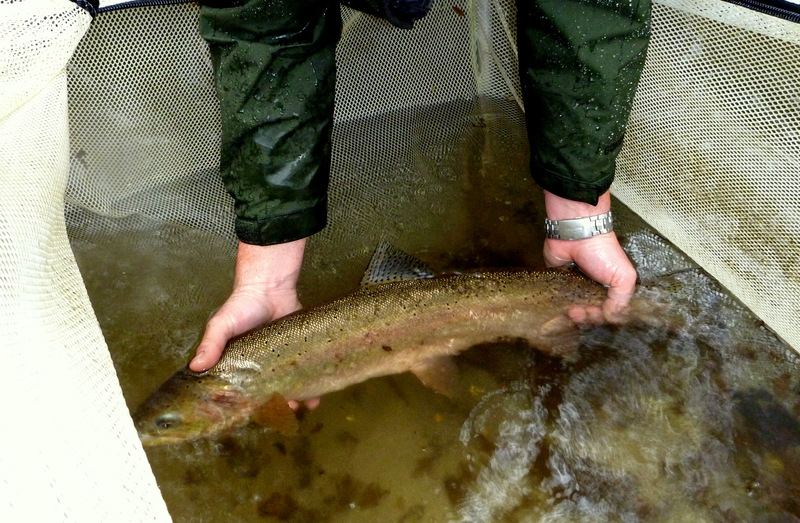 Adult steelhead return to the Napa River to spawn in the winter and spring, typically between January and March. In years with abundant late-season rainfall, adult fish have been observed spawning as late as May. Steelhead spawning is difficult to document in natural river systems because adults migrate primarily at night and spawn during winter storm flows when visibility is low. Therefore, not much is known about the specific movement patterns of adult steelhead in the Napa River watershed. In order to maximize access to steep and often intermittent streams, adult fish will migrate upstream on the receding limbs of winter storm flows. In years with below average stream flows, access to small tributary streams, which this species prefers, can be limited or completely blocked. The RCD has documented steelhead spawning in the mainstem Napa River frequently in recent years, although it appears to be most prevalent in dry years when access to more favorable tributary spawning habitat is limited by low seasonal streamflow. Juvenile steelhead remain in freshwater for one or more years before migrating to the ocean as smolts. Juveniles (also called parr) typically remain in cool, shady streams with perennial flow for up to three years where they achieve lengths of around 125 to 200 millimeters (about five to eight inches) before smolting. During their freshwater growth phase, juvenile steelhead feed mostly on aquatic and terrestrial invertebrates and may move around within a stream and between streams at higher flows to seek out suitable habitat. Little is known about the historical abundance and distribution of Chinook salmon in the Napa River watershed (Leidy et al., 2005). Based on accounts of the Napa River’s historical conditions and its proximity to the entrance to the Sacramento/San Joaquin River systems, it is likely that the watershed once supported a relatively large, sustainable population of Chinook salmon (Stillwater Sciences, 2002). Napa River salmon populations were not well documented during the early twentieth century and may have been extinguished completely for some period of time. During the last decade, however, juvenile salmon have been regularly collected in the Napa River and adult spawning has been observed in most years, suggesting that a process of recolonization may be underway. The Napa River Chinook salmon population is not included in either of the nearby Chinook salmon Evolutionarily Significant Units (ESU): the Central Valley Fall/Late Fall Run and the California Coastal Chinook Salmon ESUs. However, recent genetic analysis of Napa River Chinook samples found that ancestry of Chinook salmon from the Napa River is primarily from the Central Valley Fall/Late Fall Run (Garza and Crandall, 2013). Chinook salmon enter the Napa River to spawn in the fall, typically around late September and early October. Adult fish will hold in the lower river and estuary for a month or more waiting for the first rains of the season. In some years, when these first rains do not arrive until early winter, salmon migrations are completely blocked and the fish presumably perish in the estuary or swim back out to the estuary to try another stream. In a more typical year, adult salmon swim immediately upstream with the first rains and stake out suitable spawning areas. Salmon quickly find mates and construct spawning nests (i.e. redds) in the streambed gravels and cobbles, typically within a day or two. After spawning, spent salmon will remain in the area for up to several weeks protecting their redds until they ultimately die. 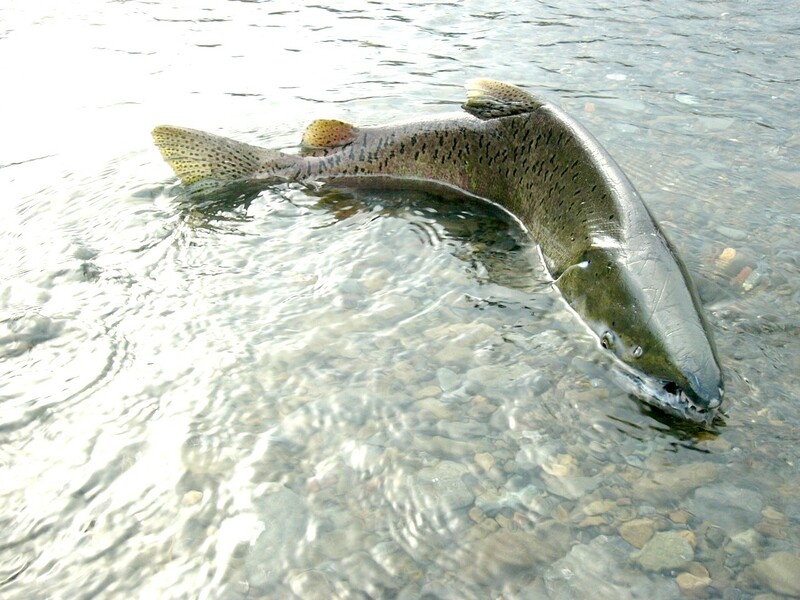 Peak Chinook spawning activity occurs from November through early January. Juvenile Chinook salmon spend several months rearing in the Napa River from January through June. Juveniles feed primarily on invertebrates during their freshwater rearing phase, which can last from two to five months. Chinook salmon smolts are typically 80 to 100 millimeters long (approximately three to four inches) when they leave the river and enter the estuary. Outmigration occurs throughout the spring with a peak occurring in May. What types of fish exist in the river? As of 2016, monitoring has documented 31 fish species in the rotary screw trap. However, five of these species occurred only once or twice, and therefore do not appear to have self-sustaining populations. Is our fish community comprised of mostly native or non-native species? Of the 26 fish species regularly captured in the rotary screw trap, 13 are native and 13 are non-native. Interestingly, native fish account for over 90% of the total catch every year; therefore, it appears that, although non-native species are present, the Napa River fish community is comprised of primarily native species. How many steelhead and salmon spawn in the river each year? This is highly variable and still not very well known. Based on monitoring data, the number of steelhead spawning in the river each year likely ranges from hundreds to perhaps a thousand adult fish. Salmon are much more variable, with some years producing no spawning activity, and other years with relatively high abundance - perhaps as many as several hundred adults. Are there trends in the steelhead and salmon abundance over time? Steelhead smolts have been consistently collected in all recent sampling years (2009-2016). Over the past eight years, steelhead smolt catch rates exhibit an increasing trend from 2009 to 2012, followed by a sharp decline in 2013 and continued lower catch rates through 2016. The cause of this trend is not well understood; however, there appears to be a correlation between steelhead abundance and rainfall, with the highest catch rates following relatively wet years and the lowest catch rates following relatively dry years. For Chinook salmon, the data do not show any clear trends during the past decade. The salmon population in the Napa River appears to be small and opportunistic, with the highest numbers occurring during years with more rainfall and early-season flow. Napa River steelhead smolts have been consistently large in all sampling years (2009- 2016), with an average length of 189 millimeters (7.4 inches). It is well known that larger smolts have a significant survival advantage in the ocean and return to spawn at much higher rates than smaller smolts (less than about 6 inches). Based on the size of our smolts and existing literature, estimated ocean survival would be around 25%, meaning that perhaps one in four smolts returns to spawn as an adult. What are the origins of steelhead and salmon in the Napa River? No artificial stocking (i.e. 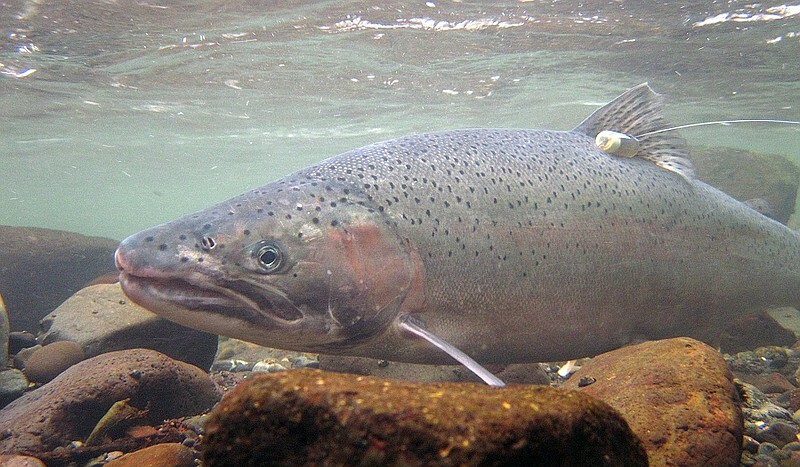 planting) of hatchery steelhead occurs in the watershed. Therefore, it is presumed that the Napa River steelhead population is wild and self-propagating. The origins of Chinook salmon in the watershed are not as well-known, as described above. The RCD is actively working to try to determine the origins of Chinook salmon in the watershed, which has proven difficult due to their sporadic presence and the challenge that poses for collecting tissue samples (e.g. genetics, otoliths) from a sufficiently large sample size. Are habitat restoration efforts increasing steelhead and salmon counts? With sufficient time (perhaps 15-20 years), we should be able to assess whether ongoing restoration efforts are affecting the number of steelhead and salmon smolts being produced. Large-scale restoration and fish passage barrier removal projects will take time to achieve their intended ecological benefits. Based on this reality, we simply have not been monitoring long enough to gauge the effects of these projects on fish populations in a meaningful way. How is the drought affecting steelhead, salmon, and other native fishes? Drought conditions are especially hard on salmonids because of their requirements for cool perennial flow. During the past four years, monitoring has shown decreased numbers of salmonids in the rotary screw trap, which suggests that the dry conditions have reduced their summer rearing habitats and thus limited their production. Other native fishes are well-adapted to California’s warm dry summers, and appear to be weathering the drought just fine.